The University of York Science Education Group (UYSEG) is at the beginning of a new project to develop a course for teaching science at 11-14. The Best Evidence Science Teaching project began by asking science teachers what for them were the key issues about teaching science 11-14. We will be using the best research evidence available to address those issues. I’ll be discussing this new project at researchED Maths and Science in Oxford on Saturday 11th June 2016. Ahead of my session, I wanted to explore the thinking behind the UYSEG Twenty First Century Science project. Recently we have been working on the third edition of Twenty First Century Science, a GCSE science course that followed the work of Beyond 2000. In this most recent edition of the project, we have drawn on ideas from the ‘backward design’ approach of Wiggins & McTighe (2005). The backward design approach places assessment at the heart of the planning process. Thinking about assessment early in the planning process helps to clarify the intended outcomes, which in turn helps to determine the most appropriate learning activities. This has been described as curriculum planning by reverse engineering. To this end every assessable learning outcome (ALO) in the specification has at least one associated teaching and learning item, in the form of a question, task, activity or practical. At the beginning of any new teaching sequence the teacher may need to assess the learners’ prior knowledge and also find ways of introducing the new concepts identified by the ALOs for this sequence. This introduction might be an intriguing demonstration of a phenomenon or perhaps a photograph of a context that prompts one or more questions; the phenomenon can be explained and the questions answered using ideas to be developed in the sequence. The middle phase of a teaching sequence will encompass teaching and learning activities that help students to develop their understanding of the scientific explanation behind the ALO that is the focus of the teaching. The application of the scientific ideas to new contexts challenges and develops students’ conceptual understanding. An important part of any teaching sequence is to elicit evidence of student’s progress in understanding the key ideas of the sequence. This may occur during the sequence to inform the next steps in the teaching, as well as at the end of a particular sequence. We have used this model as the basis of the section organisers in the Teacher Handbook. 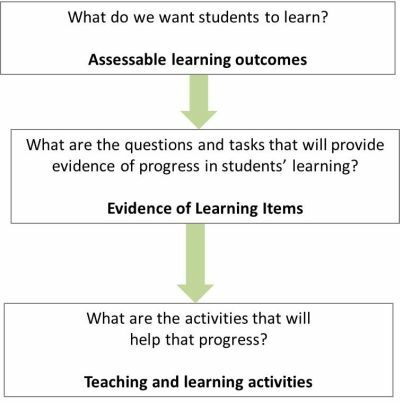 For each sequence of teaching (which may be one or more lessons) we have identified teaching and learning activities and evidence of learning items that can be identified as serving one of these four purposes. In using this approach we have drawn on ideas in the ‘5Es’ approach to curriculum design (Bybee et al., 2006). The University of York Science Education Group (UYSEG) has an international reputation for its research-informed curriculum development. We draw on our work, and the work of others, to develop courses that are used in the UK and have also been adapted for use in many other countries. Mary’s presentation from researchED Maths and Science is now available to download. Bybee, R.W., Taylor, J.A., Gardner, A., Van Scotter, P., Carlson Powell, J., Westbrook, A., & Landes, N. (2006). The BSCS 5E instructional model: origins and effectiveness. Colorado Springs, CO: BSCS. Whitehouse, M. (2014). Using a backward design approach to embed assessment in teaching. School Science Review, 95 (352). Wiggins, G., & McTighe, J. (2005). Understanding by design. New Jersey: Pearson Education. Mary Whitehouse is a member of the University of York Science Education Group (UYSEG) where she directs the Twenty First Century Science Project. She has taught science in schools and colleges as well as working in science curriculum development and publishing. Mary was editor of the ASE journal School Science Review 1996 – 2000. She has taken part in a number of major curriculum projects in science education – including Science in Society and SATIS with ASE in the 1980s, Advancing Physics with the Institute of Physics and OCR, and Twenty First Century Science with OCR, UYSEG and Nuffield. ← Fieldwork at GCSE is changing – how, and what are the implications?